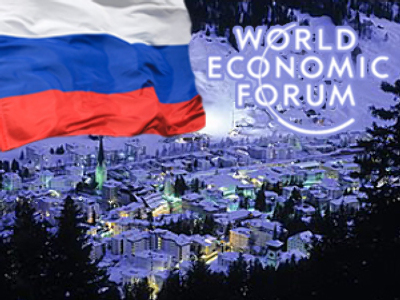 The world's largest event of its kind – the Davos Economic Forum – has kicked off in Switzerland with Prime Minister Vladimir Putin delivering a key-note speech at the forum’s opening ceremony. As the largest recession in decades continues gaining momentum, Russia’s Prime Minister emphasised the reasons for the crisis and laid out ways of dealing with it. “There is, I believe, a well-known concept, such as ‘a perfect storm’, that is when unleashed natural elements focus in one point of the ocean, and continue to build up their destructive force manifold. The current crisis looks precisely like the perfect storm,” Putin said. This storm has already taken its toll – especially on those who were unwilling to acknowledge it in the first place. “Just a year ago here in Davos we heard the words of American representatives about the fundamental stability and cloudless prospects of the U.S. economy. Today, however, the pride of Wall Street and the investment banks have practically stopped existing. For the past year they have had to acknowledge losses far exceeding their profits for the past quarter of a century,” Putin said. The Russian Prime Minister said the crisis was triggered by a combination of several factors occurring simultaneously. “This is the collapse of the existing financial system. It is the result of poor quality regulations. And as a result of this, huge risks were overlooked,” Putin said. “It is time to start a specific dialogue on how to make the transition into a new model – smooth and irreversible,” Putin also said. Defying expectations, pointing the finger is exactly what Vladimir Putin did not do. Instead, he frankly admitted that it is too soon to say what should be done – and he focused instead on what should not be done. “One must not allow oneself to skip into isolationism and unbridled economic egoism. Though the certain strengthening of protectionism becomes inevitable, we will still need to keep the sense of proportion. The second possible mistake would be excessive interference into the economic life of the country and absolute faith into the almightiness of the state,” Putin said. This statement definitely hit the bull’s-eye with some of the world’s top economic and industrial movers-and-shakers in the audience. “Mr. Prime Minister, you spoke of the dangers of excessive government involvement and I found myself really struck and surprised by that comment – six months ago I would have never imagined hearing that comment, but I have to say that I completely agree with you,” said Dell Computers CEO Michael Dell. It was one of the most quoted parts of Prime Minister Putin’s speech as participants filed out of the congress hall. “It was a very strong speech about confidence, and about trust, and about change, and it was amazing, I think, for all of us how strong the demands from the Russian PM were to fix the financial market – and to do it now,” AIRBUS Senior Vice President, Dr Rainer Ohler, said. To learn more about Putin’s plans for a global economic revival please follow the link. Putin's speech certainly made people sit up, pay attention – and take notes, but regardless of how soon any steps can – and will – be taken, most people seem to agree that a new economic structure will be born out of this crisis. This year, more world leaders than ever before arrived at the Swiss resort of Davos for the world’s largest economic event. At the same time, a number of corporate leaders had decided to drop out of the discussion. There is a bright side, however, as the forum is the perfect chance to take real, global steps towards change. In tough times it is apt that Davos is distancing itself from champagne and caviar, but luxury is still prevalent, and the limos and helicopters attest to that.